The tip-over tree layout is a tree layout, which uses shapes provided data to determine whether the vertex children should be placed in a row, column or 2 columns. It produces orthogonal tree drawings. 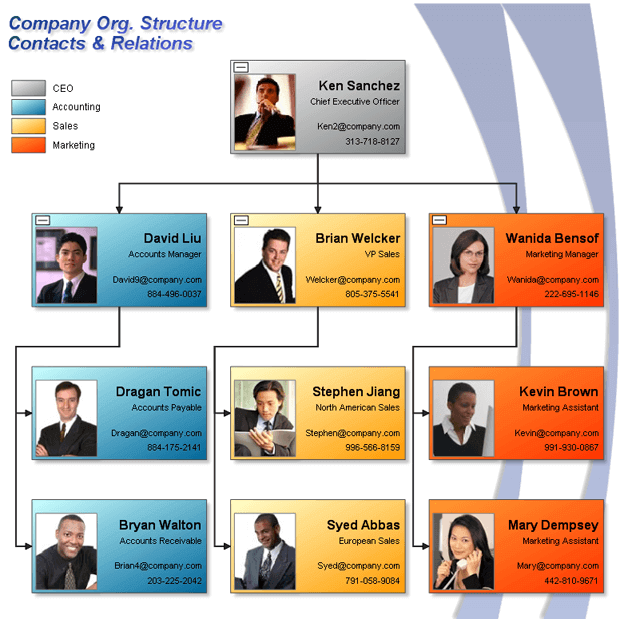 This type of layout is typically used in Org Charts, but can also be used in all cases where classical tree layouts (e.g. layouts with uniform parent placement) do not produce width/height ratio compact results. Nevron Diagram tip-over tree layout provides options to change the way the children and the leafs are placed using the corresponding properties. You can also set the children placement for the children of each vertex individually. The layout area of the diagram can be reduced by the Compact property of the tip-over tree layout.